This is another in what I now think of as my “Florida” period. On a beautiful sunny winter afternoon in the town of Seaside, in the Florida panhandle, I took dozens of photographs as the strong clear sunlight worked its magic on almost everything I saw. My “Hammock” painting came from this afternoon. 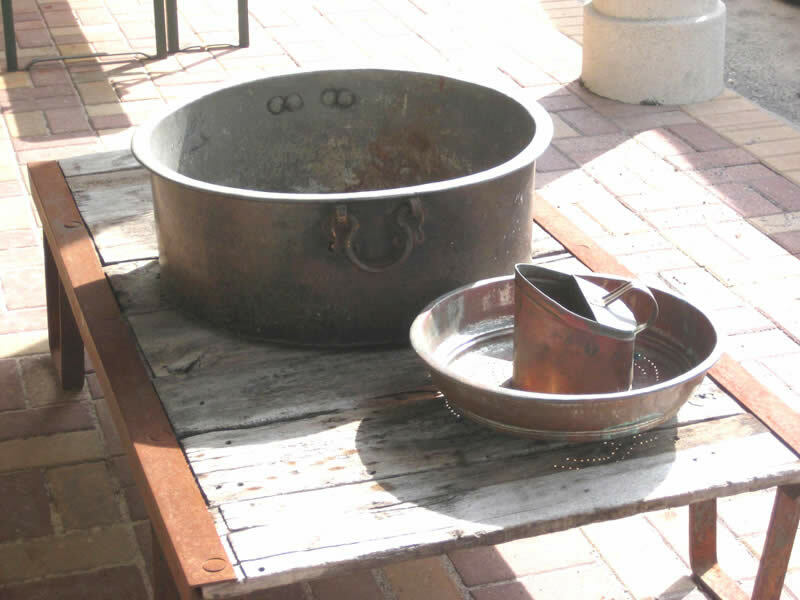 These antique copper pots had just been put out on display and the play of light, dark and shade just caught my fancy. A few minutes later and the stall owner had cluttered up this display with unrelated objects, but I liked the stark simplicity of this set-up. 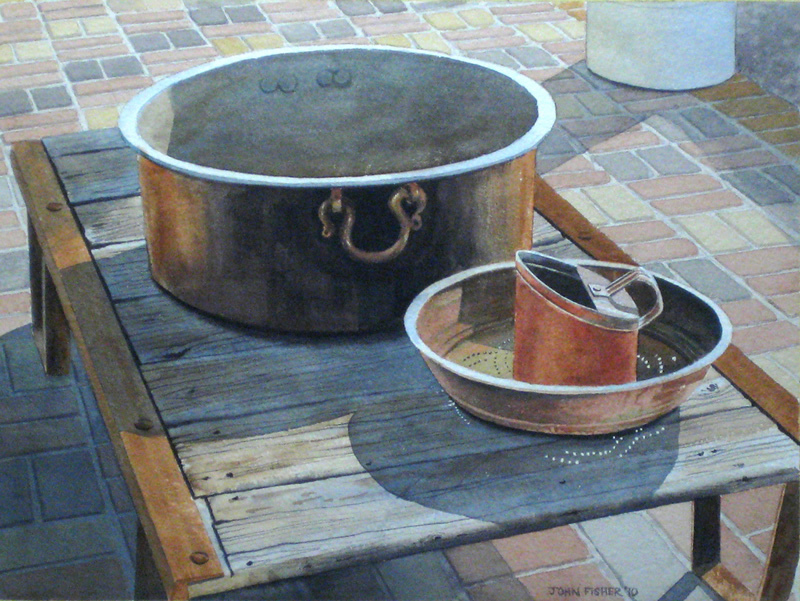 Image size 11″ x 14″ on Arches 300 lb. cold pressed paper, using Winsor & Newton Artist quality colours. 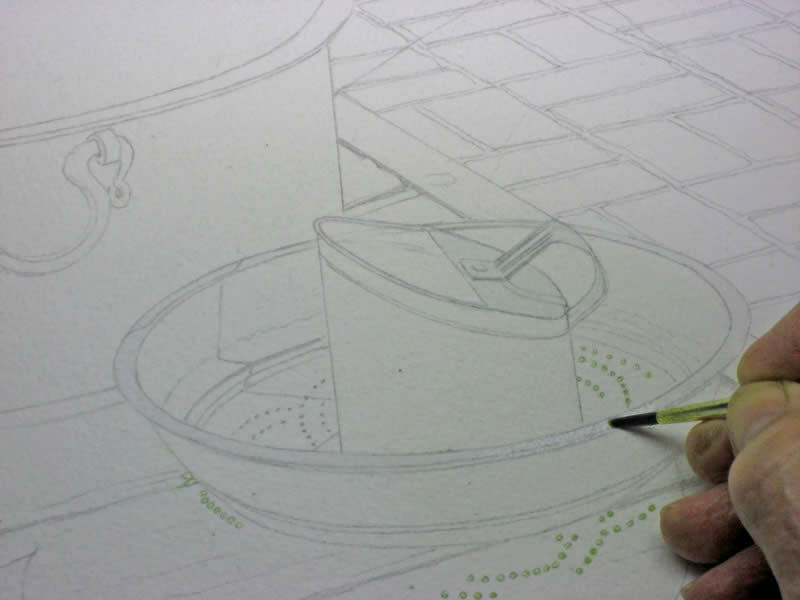 I paint for fun and the watercolours I enjoy most are those with detail, so I always do a careful drawing first and try to keep the pencil image clear until the last wash. Beginners who find difficulty in drawing cylindrical objects night want to consider turning their paper up-side down and, depending on whether you are left or right-handed, have the pencil flow in the most comfortable position. Being upside down also helps you visualize if your proportions are correct. Here is my completed drawing. At this stage I always sit quietly and paint this in my mind. I write down the steps I think I should take. When to put on liquid masking. Which colours to paint first. What colours I should mix to best represent what I’m looking at. With these written notes I can remember what I was supposed to do if I’m away from it for several days. I’m retired, so I’m in no hurry. No “all-nighters” for me. 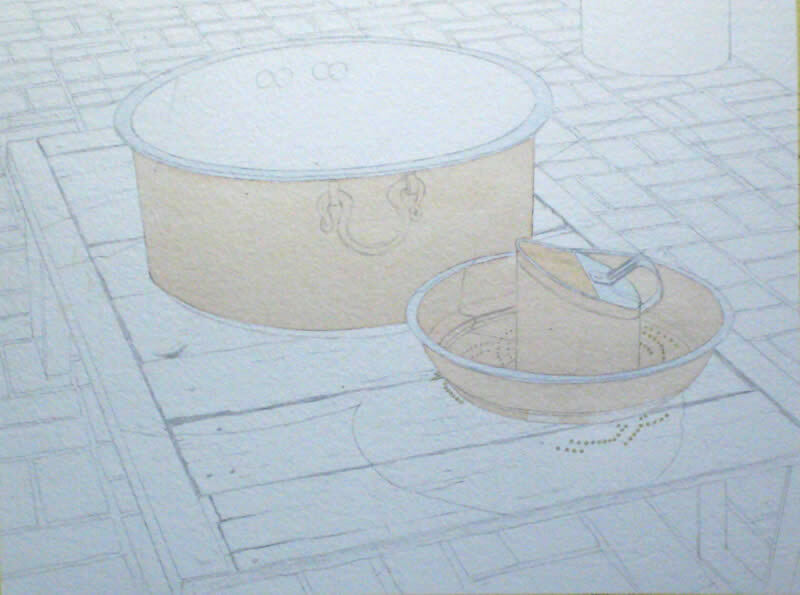 Here I’ve used liquid masking to put in those interesting dots of sunlight seen through the bottom copper pan. 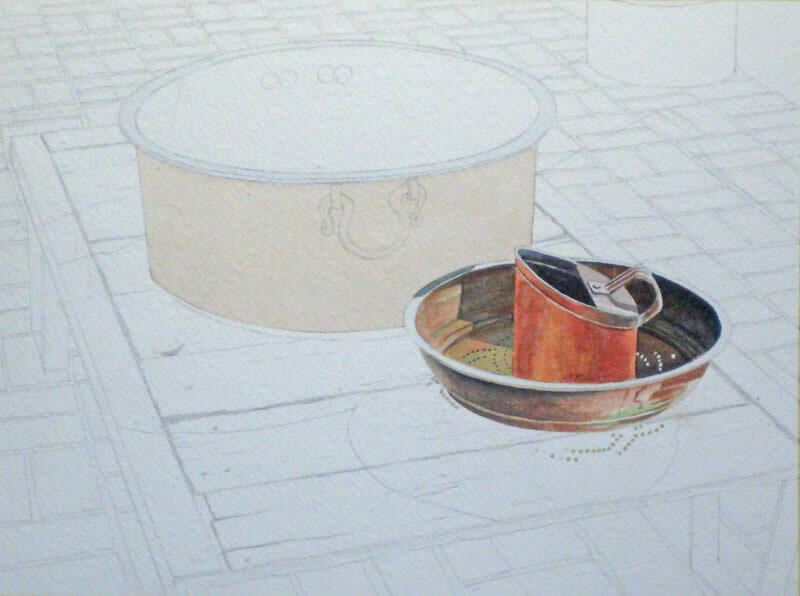 The I’ve used a very pale wash of Ultramarine Blue along the sunlit rims of the big pot, the bowl and the jug. 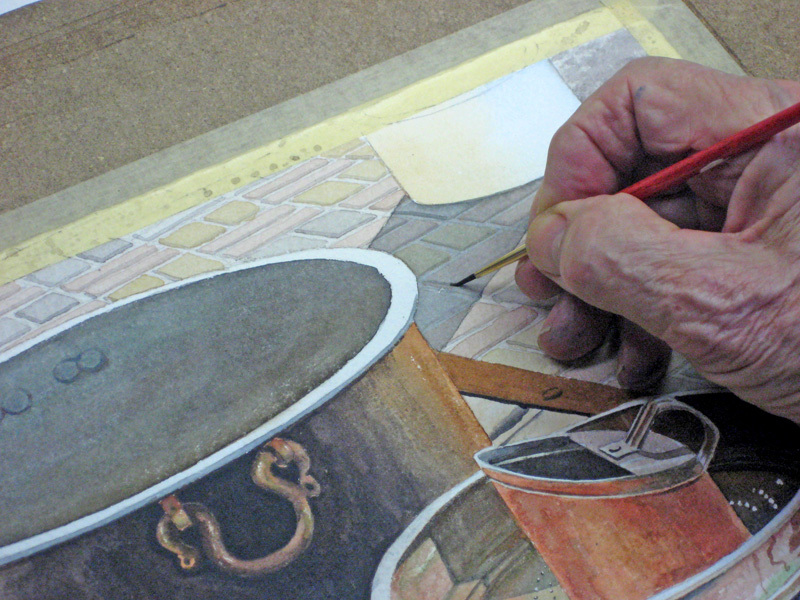 Next I used a pale under-painting wash of Burnt Sienna with a touch of Brown Madder and Alizarin Crimson. Most of this will be covered up of course, but I like to us many light washes to achieve what I want. 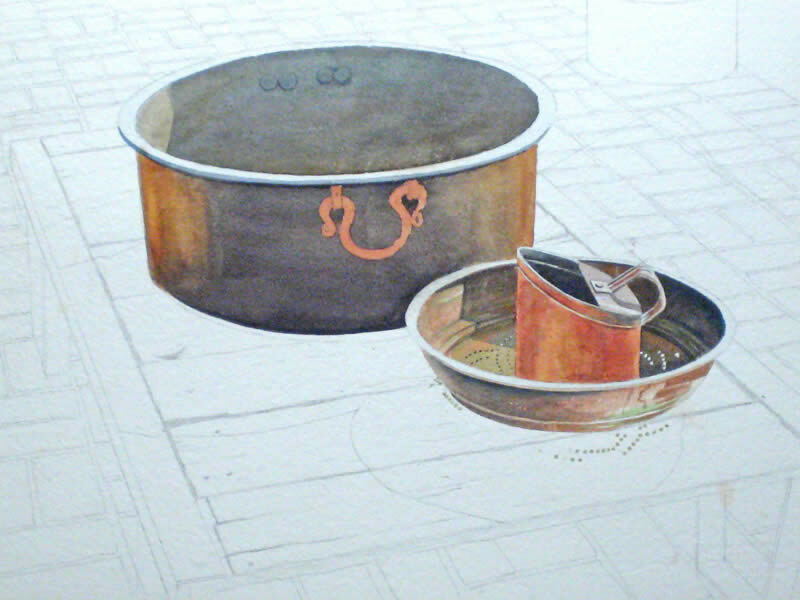 Now I’m working up my basic copper colour. I used a mixture of Burnt Sienna, Brown Madder, and Alizarin Crimson. Here I’m lifting out some muted highlights with a dry brush. 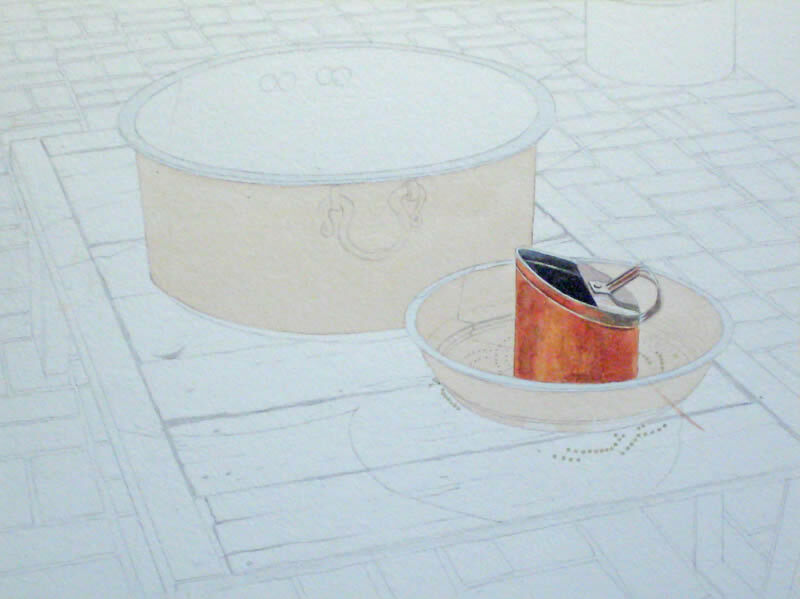 Here I’ve completed my copper jug for now. I’ve used touches of Cadmium Yellow deep and dark shadows made from Brown Madder and Antwerp blue. Now I’ve completed my copper jug and bowl using a combination of all the colours I’ve used up to now. 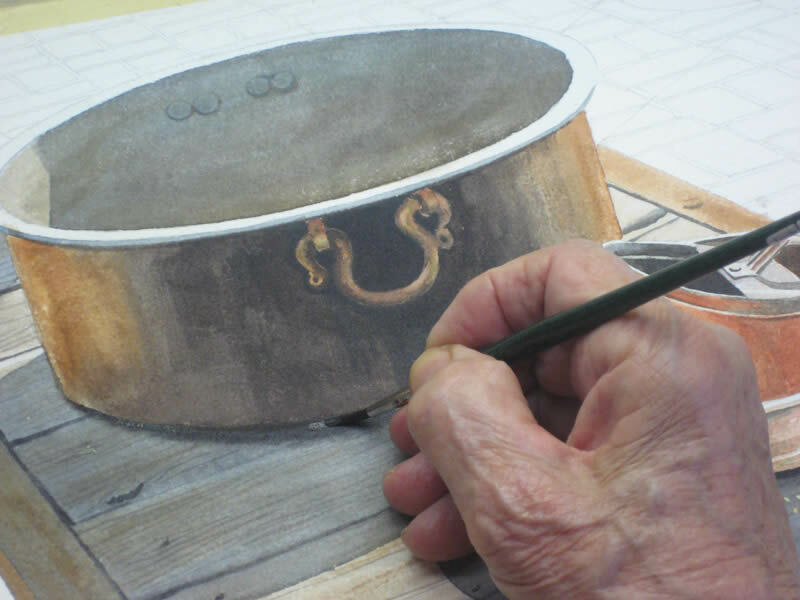 I’m not trying to copy my reference photograph exactly as the highlights were burned out a bit, and I want to achieve what I think these copper object should look like. I’ve removed the liquid masking so my sunlit holes stand out and I’ve introduced more green to emphasize the aging copper texture. I know I will probably go back in at a later stage, but the balance of light and shade seems right for now. 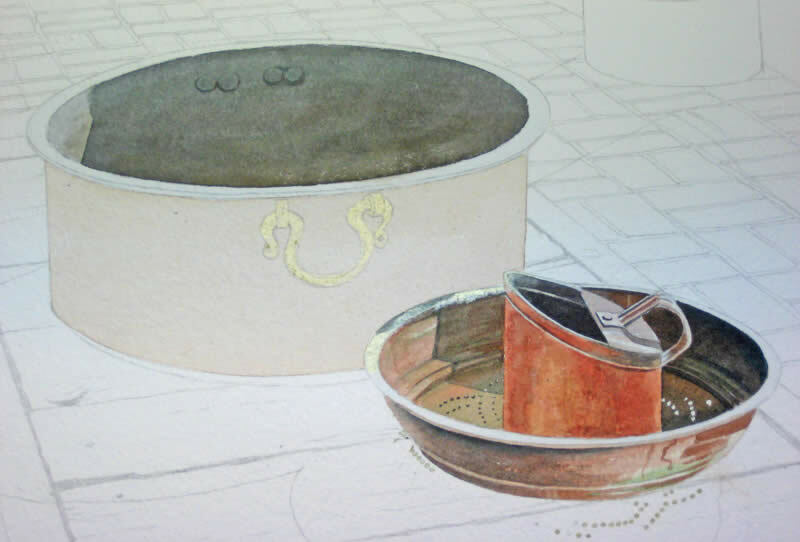 I’ve completed the inner shadows of the large copper bowl and protected the handle area and the outer rim of the smaller bowl ready for the exterior. 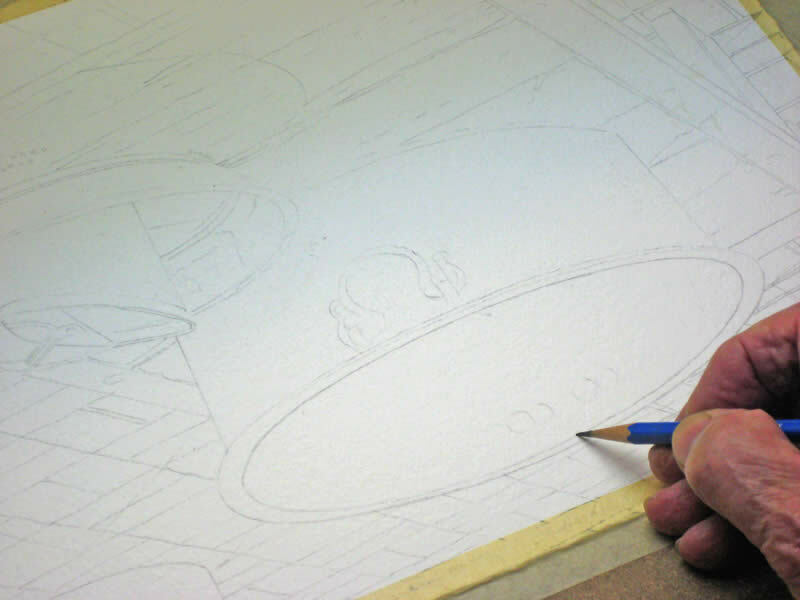 I don’t like the shadow on the rim of the smaller bowl where it meets the outer shadow area, so I will remove that later. 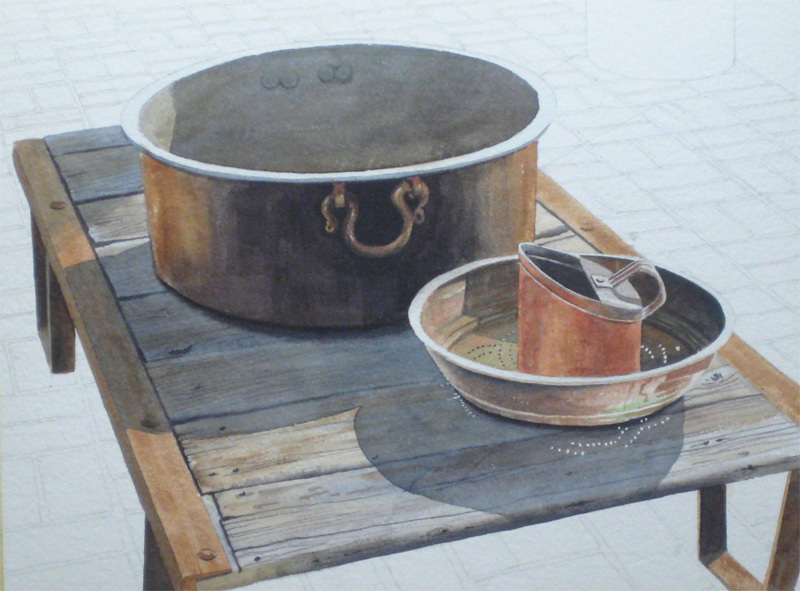 After I roughed in the wood grain I removed the liquid masking protecting the edges of the pots and put in the main shadow, using a mixture of Antwerp Blue and Brown Madder. In my original photographic reference this era was a bit over-exposed and muddy, so I used a shadow technique as shown – a shadow within a shadow. At the extreme edge of an object in shadow there is often a darker shadow. Even if it isn’t there I find it often adds to the realism. I paint in carefully and lose the edge immediately. Now I’ve petty well completed the pots and stand. I know I’ll go back and make modifications after I’ve mapped in the background paving stones, but this will do for now. I was doubtful about how dominant I wanted the background inter-lock paving stones to be, so I roughed them in first just to see how everything went. I could always darken them if needed. Next I put inthe edges to make them more three-dimensional, still keeping in mind it was easier to darken them later if needed. 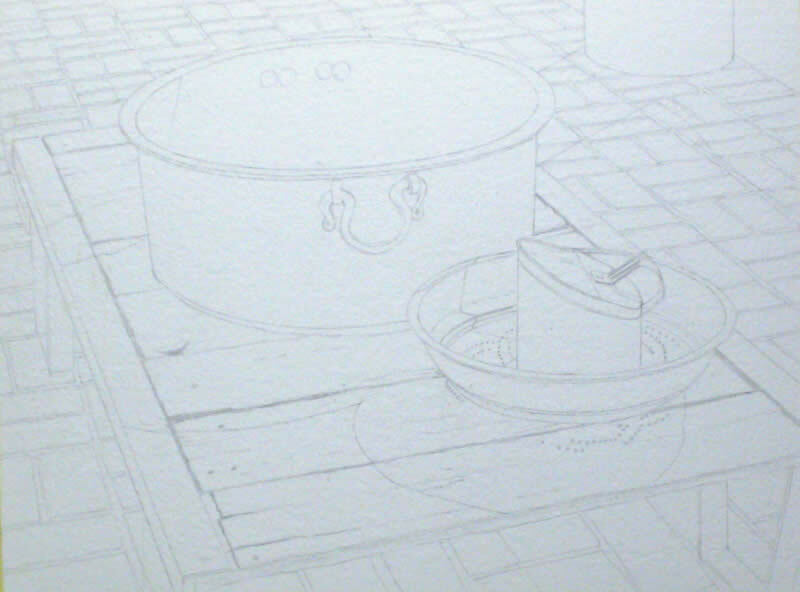 Now I realized my background paving stones were too faint, so I gave them another coat and strengthened the edges a bit as the intense shadow had washed things out a bit. Here is my final result, although I spent some time tinkering with those paving stones by adding colour in the shadow areas and emphasizing the edges. I’ll live with this for a few days and see if any of you come up with suggestions. I’m not happy with the way the jug handle makes an awkward triangle with the smaller bowl and the background stand and iron surround. 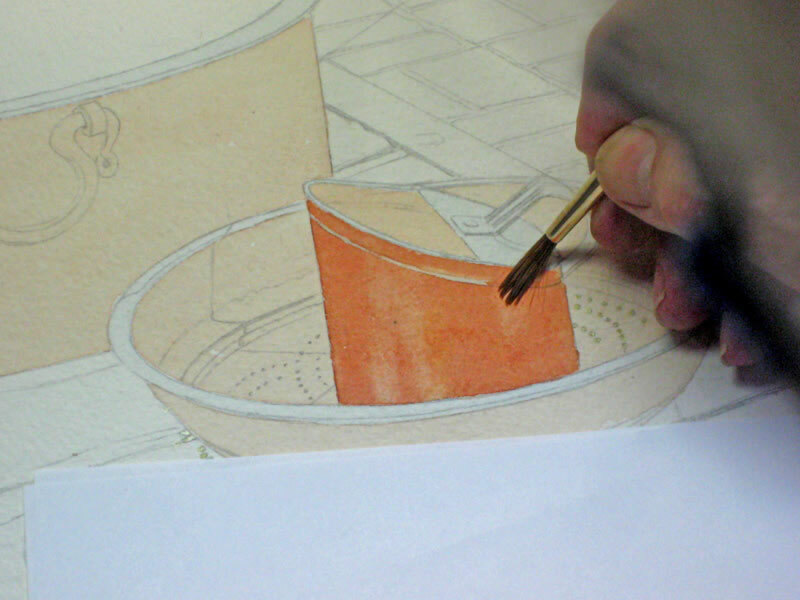 I may lift some colour and make the handle stick out more beyond the bowl – we’ll see. I decided not to add the background shadow in the reference photograph as I felt it was too dominant. I hope this demo was of use to you. 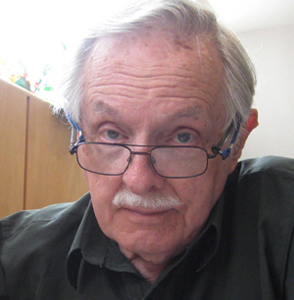 I hope you enjoyed this watercolour painting demonstration by John Fisher. 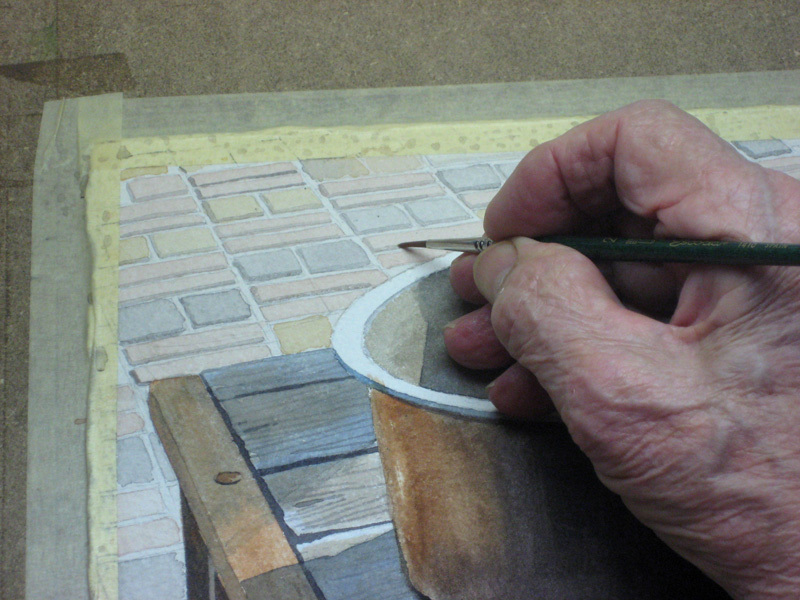 This is a great painitng, I love watercolor art! 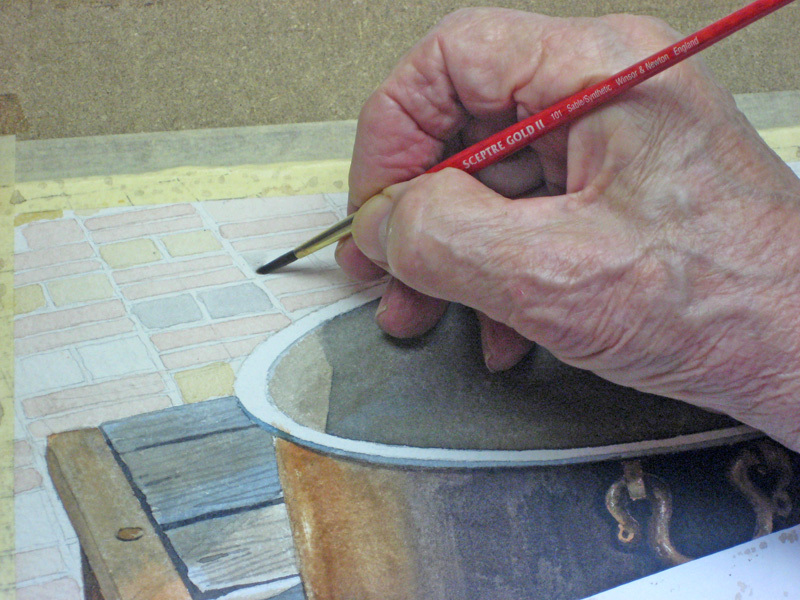 I really loved the process, especially tip 4: thinking and preparing before applying color. I’m sur it really makes the prosess easier in the long run. This is a really excellent demo John. I particularly like your ‘shadow-within-a-shadow’ technique; it really does add an extra dimension. The old copper look achieved in the large bowl is superb; I just wonder if the small bowl and jug need darkening down a tad in a similar way. You are a talented artist, I have to say. Thanks for sharing. I only wished I could have seen more of how to paint the wood on the stand–because it looks so realistic. Loved your demo,John and appreciate the different points about shadow, especially with accompanying photos. Very helpful for a newbie.